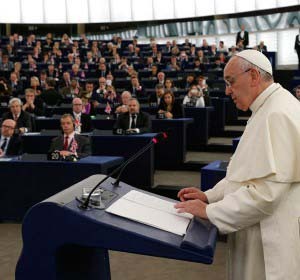 On November 25, 2014, the Vicar of Christ, Pope Francis I, stood to speak in front of the assembled members of the European Parliament. He spoke for 38 minutes. He did not once mention the name of Christ. Instead the Pope spoke on the dignity of man, the need to bridge the gaps that divide men, and the evils of any interests that do not serve humanity as a whole. In short, the Pope called for universalism; a far cry from the mission of conversion, repentance and salvation of the Popes of yesteryear. His words aligned perfectly with the revolutionary mission of the EU. 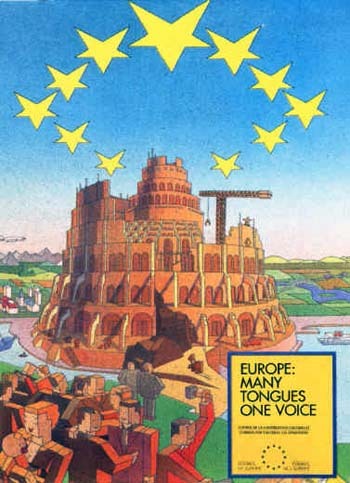 As a geo-political entity the defining characteristic of the European Union is its supra-national identity. The members of the EU Parliament and Commission have taken oaths to uphold the interests of Europe as a whole over the interests of their own individual countries. They make no secret of their belief that the future of Europe should see the increasing integration of the European States into one large union devoid of national identity. This is globalism; it is the unmistakable pattern of political developments for the last 70 years. Historically speaking regionalism, the antithesis of globalism, has prevailed for much of human history. The most successful empires allowed the diverse regions of their lands to maintain their individual identity, contributing with their sense of dignity and culture. Peoples had their laws and traditions and their own ways of contributing to the whole. 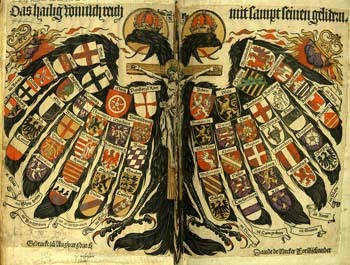 The Holy Roman German Empire – founded by Charlemagne – was an ensemble of kingdoms and baronies in central Europe all united under a common Emperor for mutual defense. It is an excellent historical example of the kind of organic society fostered by respect for regional autonomy. A functional subsidiarity allowed matters to be taken care of by the lowest competent authority: Only when the lower authority could not handle a problem, would it come to the subsequent higher authority. According to this system the imperial or royal government would but rarely intrude in the lives of the people. Contrast this history with the workings of the EU. Where traditions once dominated, socialist regulations now dictate; where local customs once reigned, now bureaucrats enforce compliance with the latest EU demands. Today the Portuguese fisherman must reduce the size of his catch to comply with the eco-friendly laws passed in Brussels and voted on by landlocked countries like Austria. To coerce compliance of member States, the EU employs a variety of methods best described by the old political idiom: the carrot or the stick. By joining the EU, a country receives many economic benefits. Trade agreements, subsidies and crisis bailouts make membership desirable to today’s money-minded politicians. But money always comes at a price. Countries soon find themselves addicted to the benefits, and the threat of losing that flow of money becomes increasingly unbearable. While the economic powerhouse of Germany generates funds for the EU, the poorer countries become increasingly addicted to aid. Presently Germany and its liberal satellites hold the economic strings of the EU. Meanwhile the conservative Eastern European nations come under increasing pressure to comply with new diktats of tolerance for all the celebrated vices of modernity. The nation is, then, faced with a dilemma: Comply with the demands of the leftist EU and enjoy an artificial wealth and praise, or refuse and face massive economic sanctions and international condemnation. With this carrot and stick strategy, the EU gradually coerces member States into adopting socialist policies. Soon the country becomes accustomed to its new position and the time is ripe for the next step. A new crisis is made and the only solution, whether in the long run or short, is to give in to the demands of globalist pressure. In this way nations slide down the slippery slope of Gramsci’s gradualism (1) and end by assimilating the basic principles of Marxism. In 2016 Hungary alone opposed a newly drafted EU homosexual law, vetoing the bill (the once Catholic Poland had finally succumbed, leaving Hungary the sole opponent). The EU begrudgingly honored Hungary’s stand, despite demands from politicians and the media that the EU force a bypass of the sole member State that stood in the way of “equality.” The idea is now in circulation that member States should be denied the power to obstruct the march of such “human rights” policies. In February 2017, Hungary again came under EU and media fire for refusing to resettle migrants. 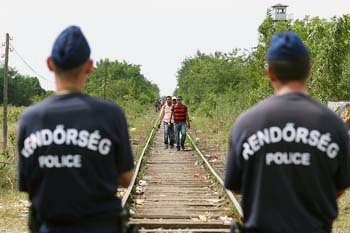 Besieged by the migrant crisis, Hungary constructed border walls and accepted only a modicum of applicants. Eurocrats in Brussels are now threatening a staggering $270,000 fee per migrant denied if Hungary does not meet the EU assigned migrant quota by September 2017. If Hungary continues to resist, it is not impossible that it will become an outcast of Europe, condemned as a “reactionary” State that “tarnishes” the reputation and image of the EU on an international level. Hungary’s stand against “equality” would thus be used as the scapegoat for the EU to give itself power to impose laws despite the dissent of so-called sovereign member States. National sovereignty would die to the applause of the world’s politicians and media. As the member States become increasingly addicted to EU funds, the situation increasingly mirrors the development of the United States of America. Initially the United States was just that, a union of States where each State held a significant degree of autonomy. Over time - and after a horrendous war - that system gave way to the States becoming dependent on the federal government in Washington. Today, our States, practically speaking, are provinces of this federal government. Any significant State dissent is crushed by corrupt legal precedents, a vociferously leftist media and the threat of withholding federal funds. For many States federal funds alone are a matter of life and death. Europe is increasingly following this trend. 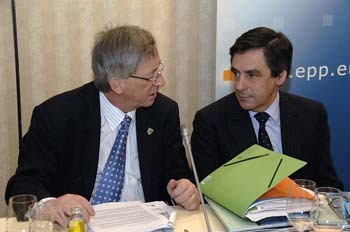 Nations join the EU for funds and economic benefits. Shortly after, the loss of those benefits becomes unthinkable. Soon the nation is reduced to an addicted servitude where it cannot afford to say “no” when strings are attached to EU money, nor can it afford to leave and be cut out of the economic circle of the other European States. The UK voted to leave, and even so it will take years and huge amounts of money and paperwork to do so. If leaving is so troublesome now, it is easy to surmise that it will be even more difficult to do so later. Meanwhile, Brussels chips away at the independence of nations, either through economic coercion or under the guise of policing member States for “human rights violations” of opposing homosexual marriage or forced migrant resettlement. This is the future prospect for the EU. If the nations of Europe do not act now to dismantle this growing threat, they run the very real risk of slipping by slow degrees into an inescapable mire of cultural, political and economic servitude to the socialist ideal of a Pan-Europe. Eurocrats, who are proud of their supra-nationalism, long for the day when they will see European nations give way to a single Europe, which is to say, towards a godless Universal Republic of Man. Relying on gradualism, infiltration and the dialectic process rather than a bloody revolution, Italian Communist Antonio Gramsci’s transformational Marxism was so subtle that few noticed the deliberate changes.